Multiflash предназначен для расчета фазовых равновесий. Отлично считает гидратообразование и ингибирование гидратов. Модуль программы включен для расчетов фазовых равновесий во многих коммерческих программах. Infochem’s rich software and intellectual property in the chemistry of oil and gas fluids enable accurate modeling of reservoir fluids to maximise production – "flow assurance.” KBC offers two Infochem Flow Assurance Software products: Multiflash and FloWax. 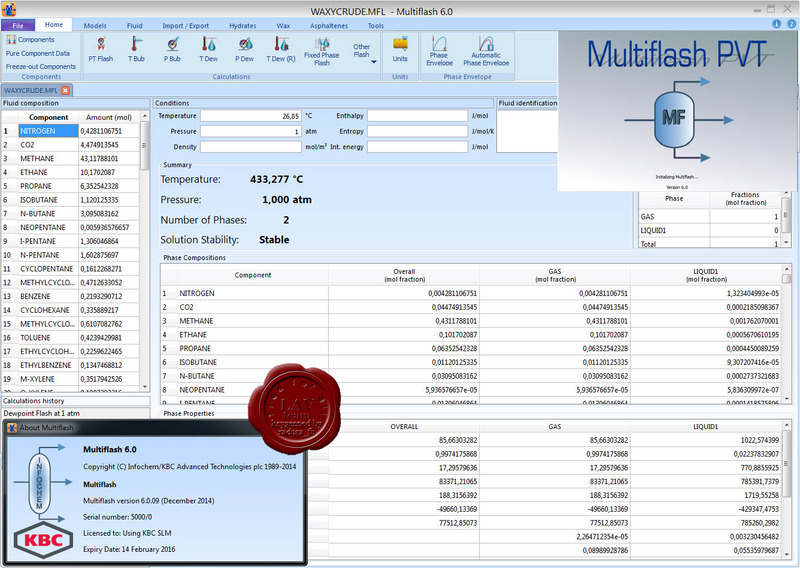 Multiflash is a multiphase equilibrium package. More info. KBC’s unrivalled software simulation, modelling, and other analytical tools allow your team to operate your facilities more profitably, manage environmental and operational risk, optimise upstream and downstream processes, and maximise production. They also allow you to accurately model reservoir and production fluids to provide flow assurance with Infochem’s Multiflash, monitor resource and energy usage to achieve environmental responsibility goals, and combine KBC process expertise with Petro-SIM simulation software to uncover no-capital or low-capital investment opportunities enhancing daily operations. Petro-SIM 5 is the first commercially available steady state process simulator that accounts for time-based modelling, in combination with scenario management and assessment of cumulative results, to allow for life of facilities modelling. 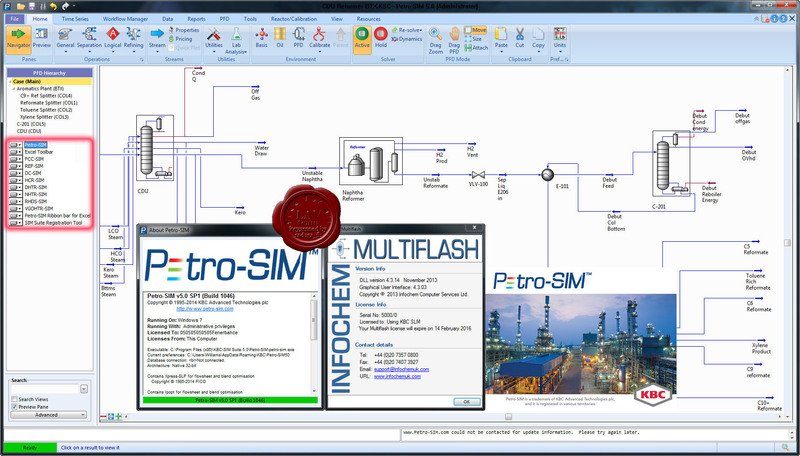 Petro-SIM 5 incorporates game-changing Workflow Management into a process simulation platform; the enablement of workflows provides the ultimate in design, rating and optimisation of your facilities. The Workflow Management system is designed to be simple enough to allow easy configuration by a non-programming user allowing the easy configuration of pre-built workflows in a single case, but powerful enough that someone with programming skills could complete repeatable and complex workflows outside of Petro-SIM for use in multiple cases. Petro-SIM 5 with Infochem's Multiflash is the only purpose built oil and gas facilities process simulator environment that combines the rich DNA of process simulation with a fully integrated PVT engine such that flow assurance studies and black oil characterisation can be completed directly inside the process simulator.